When in Chrome, every time I try to enlarge a hi-res jpg all the heho windows crash. In Mozilla it takes years to transfer data. It's not my computer - which has just been deloused. Is this only associated with Kew images? They seem to be large and slow to load. 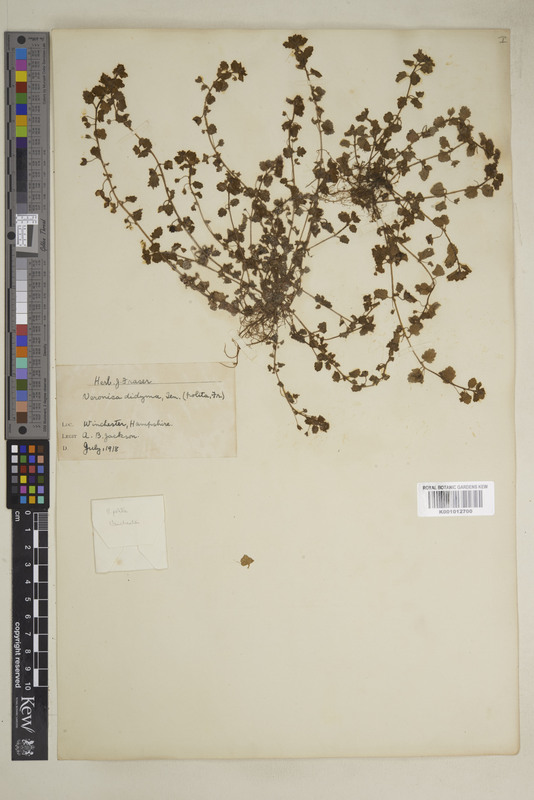 Compare two sheets of Veronica polita from Albert Bruce Jackson, Winchester, 1918: sheet 370658 image is from Kew (4,912px � 7,360px), whereas sheet 359226 image is from SLBI (2,472px � 4,182px). Other Kew images are even bigger. You can get image sizes by right-clicking on them in Mozilla and choosing 'view image info'. Safari also seems to be quick to load images. Yes: it seems to be the Kew images. I've had a go with ABS without trouble. Until the problem is resolved, when looking at K plants I'll use a reading glass. Is anyone having as much trouble as me editing Kew sheets? I'm having to use very complicated slow methods and I foresee giving up rather than plodding along at a glacial pace. 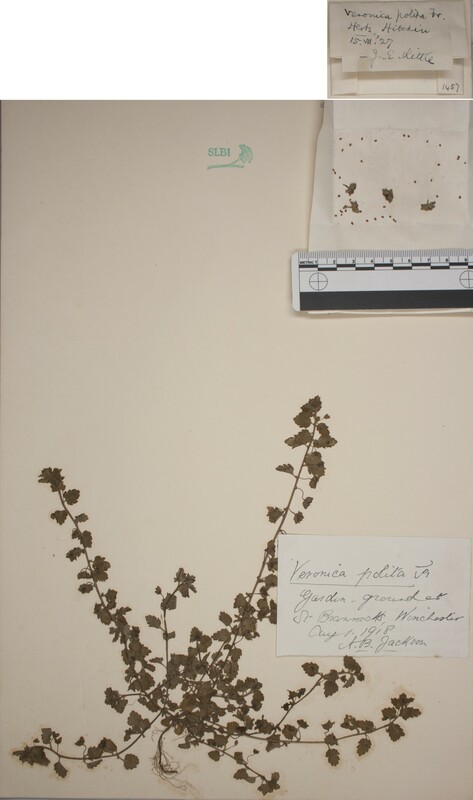 My old computer may be partly to blame, but I can edit sheets from other herbaria and review normally. Is it only the 'hi-res' images that are causing problems or are the zoomable images shown with the documentation form or the full page view images linked from the thumbnails also difficult to open? Although I've tried with a range of computers, web browsers and image software I've yet to recreate the bugs (which have been reported by several people). The 'hi-res jpeg' images are quite large, so it seems quite possible that these could be causing problems, but the other images sizes are much smaller. I could if necessary generate a more reduced image size - but it seemed a shame to strip out the detail from the Kew images. For Kew images I've changed the links from the footer of the documentation form to link to lower resolution versions, does that resolve the problem or is there something more that I am missing? Is the problem occurring on Windows computers or is this exclusively an Apple problem? My computer is Windows. It is the hi-res jpgs that crash the browser not the documentation images. I have just tried out the Opera browser on my Windows lap-top, and it seems to render Kew images faster than Firefox or Safari. There are a few oddities. When editing a sheet, and zoomed in, it seems impossible to navigate to the right of the image by clicking on the thumb-nail (top right). I just had to drag the main image. Fonts, boxes, and pop-up messages may look different. No experience of Chrome or Ie !